Yarr, it looks to be a decent Port! Eyes on the roa- erm, sea! By now, we're used to publishers being coy when it comes to showing off their Wii U versions of multiplatform games. More often than not, we won't actually get to see Wii U-specific footage or screenshots until the day of launch, when the community gets its hands on the game. Silence is deafening, as they say, and when a company withholds this kind of media, it's usually for a good reason: such as their port being something of a stinker. Thankfully, that doesn't seem to be the case with Assassin's Creed IV Black Flag. Again, Ubisoft have been rather tight-lipped on the whole affair, instead choosing to showcase the PlayStation 4 and PC versions. We've even seen plenty of footage from the now-technically-last-gen consoles. But what of the Wii U version? Is it going to be another sloppy port like Assassin's Creed III was? We wouldn't be so sure. These screenshots, uploaded by NeoGAF user Bizubani, were taken in-game using the Wii U's Home button, and uploaded via the console's Internet Browser. They show off some neat texture detail, and, seemingly, some impressive anti-aliasing results. Also of noteworthiness are the file sizes for the different versions of the game. The digital version of the Xbox 360 and PlayStation 3 games each take up around 9.6-10GB, whereas the Wii U eShop download sails in at a whopping 14GB. Could this disparity in file size be a case of improved textures in the Wii U version? We're not entirely sure, but nonetheless, it looks like Ubisoft may have been taking this port seriously after all. Noobrydar on Twitch.tv is doing streams of the game on Wii U if people want to see extensive gameplay. "Is it going to be another sloppy port like Assassin's Creed III was? " - what does this mean? it was perfect on Wii U. Looks like another game for my Wii U. Glad I waited. @dumedum AC3 on Wii U had framerate issues. It's pretty damn good looking, the first area that shows how to move etc has much more detail than AC3. I think they were refering to how AC3 did not take advantage of the Wii U's power but the framerate issues were not so bad as to make the gameplay bad or ruin the experience. @dumedum It had appalling pop-in, texture loading issues, and an extremely choppy framerate. Not to mention the Surround Sound hitches. I watched a comparison video between the 360 and PS4 versions of the game that said they were virtually identical, but gave a slight edge to the PS4. In fact, the review seemed disappointed the differences weren't more apparent. Therefore, I can't believe that the Wii-U version will be that much of an improvement over the 360 and PS3 versions. These shots look pretty next gen to me! This will most likely be a black Friday purchase for me. Wii u version all the way! I'd like to see direct comparison but from what I've seen of PS3/360 versions this looks like considerably higher texture resolution. And as I don't really care about PS exclusive DLC, I'll probably play AC4 on Wii U while waiting for Watch_Dogs. hope it runs smooth and without glitches... but looks good nonetheless.. i will buy it... when i have played my other games.. or at a good price. Can someone remind me of the new way to post photos besides just to Miverse? Bought ps3 ver with intention of trading for wiiu ver when it comes. The ps3 ver is very choppy,has little to no anti alising and just generally looks bad at 720p. What... effort being put into a Wii U port? Gonna dl this from the e-shop when im done with AC3. Looks like a good port? Is that a pun? Because pirates. Plundering this in a few weeks when I've got some disposable loot. Thank you for shopping with us. We thought you'd like to know that we shipped your item, and that this completes your order. Your order is on its way, and can no longer be changed. If you need to return an item from this shipment or manage other orders, please visit Your Orders on Amazon.com. I bet most reviews do not mention anything about the Wii U version of any of these multiplatform games. I've noticed a strange trend of reviewers not being sent Wii U copies of games, which the publishers then complain have sold poorly. Wait, this game has been out in the US for 2 days but we still don't know what it looks like? I've also noticed in advertisements games like ACIV and Batman are not being advertised as also available for the WiiU. Only the kiddie games are being advertised that way. It looks really great on Wii U! 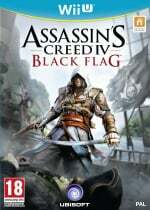 Admittedly, even though I've been an on-and-off fan of previous entries in the series, I'd love to try Black Flag. I skipped ACIII on Wii U because I borrowed the PS3 version for a little while and really wasn't a huge fan of it, but this installment looks like it might be worth trying. @sinanziric Actually he is not playing the PS3 version I guess you weren't paying much attention. There's been plenty of effort put into the Wii U port of Deus Ex Human Revolution but this website has chosen to ignore it. I expected it to get little attention on multi-format sites but a Nintendo-only site really should have got a review up. I guarantee if it was a Nintendo-published title it would have been up a week ago. Maybe just maybe it is improved textures. After watching a ps3/ps4 comparison video extensively I can say that the scenes on the boat with the black guy and Edward were mostly similar but the difference in quality was visible in the skin and clothing of the black guy. His skin definitely looks realistic than the ps3 and almost at the ps4 level. However, the ps4 did have non blurred out water in the background but hey what can we expect really? Yes, I'm playing it and it's awesome. The gamepad integration makes the whole game seem like a real cyberpunk place with you included. Newspapers, hacking etc. It needs more attention even though it is a remake/"director's cut". I think the review is in the making. I picked up the game yesterday for the Wii U. It looks and plays great! It appears that it will be a better "pirate" game than an "AC" game but I am totally fine with that. @electrolite77 We are working on a review of DE:HR. It's kind of hard to post the review in a timely manner when you get the review copy on the day of release. Very cool i pre-ordered the skull edition from game. It made me think as the wii-u assassin's creed black flag comes out the same day as pc,ps4,xbone so it must be on a par with them version's. Fingers crossed the WiiU version has multi player ( online ). Hmm should I buy this or Deus Ex? 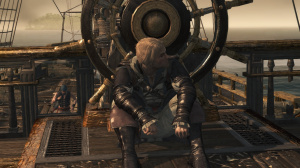 I do love pirates and loved AC2..but 3 was not my cup of tea. Is it true that its all about exploring and having freedom from the start? Waiting for Deus Ex to arrive from Amazon. After that, it's either this or Ghosts to dominate my late-night, kids-tucked-in gaming. It really comes down to the quality of either port... Considering the likely Wii U features (dual screen multi and Wiimote controls, in particular), Ghosts has the upper hand at this point; however, it's exceedingly difficult to pass up a good Pirate game... Especially once winter looms. It looks even better in motion and quite honestly it's probably the best looking game on Wii U period! Ubi really put the effort in this time & it has paid off. I rented the PS3 version just for comparison's sake & did some back & forth on several scenes & the Wii U copy is by far the best looking. It has higher resolution & textures, very crisp looking. It also doesn't bog down the way AC3 did in the cities. You can notice discernible difference in clothing textures in the cut scenes as well. Quite honestly I was surprised to see that big of a difference but it's there & Wii U owners have very little to complain about minus the DLC that's PS exclusive of course but otherwise Ubi delivered! Did I mention how friggin fun the game is???? Cant wait for this to be released in the UK. More so now having seen these screens and read some of the comments from US players. It does surprise me why publishers are being coy when it comes to showing off their Wii U versions of multiplatform games. Especially when there is nothing wrong with it and it compares better to other platforms. UbiSoft and others will complain of low sales etc. yet they do nothing to promote the sales. They don't release Wii U-specific footage, screenshots or exclusive functions/modes for the console that surely would increase awareness for their game but also the Wii U.
I hope a high percentage of the 450,000 worldwide WiiU owners buy this to convince UbiSoft not to stop supporting the Wii U after WatchDog. Awesome screens, definitely picking it up but probably around Christmas time. Can't wait to play it! I had WD preordered and paid for at GameStop but with the delay am going to trade it for AC4 or Ghosts.....the lack of reviews is annoying but I think there is really a concerted effort industry wide to squeeze Nintendo out of the console market. Many good WiiU games coming out now with so liitle attention...meanwhile ps4/xb1 getting hyped to high heaven when their launch lineups are all muktiplats and indies coming out on ps360. Aso the AC4 commercial does show WiiU box but Ghosts and Batman commercials make no mention. I think its because everyone is planning on dumping WiiU next year and don't want sales or recognition that they are publishing for it. I honoestly beleieved Nintendo could right the ship with WiiU but I just don't know anymore as 3rd parties hate them and retailers don't even understand the product......meaning it is Nintendo vs. the gaming world. It definitely looks great, much better than the x360 screens I was looking at.... Someone at the source link provided a comparison between the x360, ps4 and the Wii. U version. The x360 version is a blurry mess, the ps4/Wii U versions both looks identically sharp, the only difference I can see is the shadow quality on the ps4 version is superior..... If Nextgen means better shadows, then I'm not even bothering with buying ps4/xBone, I'll get a steambox for my multiplatform titles...... Who was it that said Wii U isn't Nextgen? Pfffttt neither is ps4 confirmed. Well, I might buy this after all, just not any time soon. Make no mistake people, the Wii U's strong suit is textures. I've noticed this more and more with various games. Wii U may not be as strong as the PS4, but it's definitely got enough of an edge over last gen that I can visually notice a difference in textures (depending on the game of course- some are just poorly done or not optimized well). It's not much to go on for visual superiority to last gen, but it's certainly appreciated. When I bought my Wii U, I convinced myself I was basically getting a PS3 that played Nintendo games and had dual screen mechanics (which was MORE than enough to sell me on it, mind you) so anytime I notice better visuals or whatnot, it's a nice bonus. Wii U also has phenomenal disc-read speeds- in fact Ubisoft was able to release Splinter Cell Blacklist on Wii U without a mandatory 3gb texture package install like the other versions had, because the Wii U was able to load them in via disc while playing. I think the system will also begin show off even better performance as the years pass. After all, we're comparing year one games and understanding of Wii U architecture with last-year games on PS3 with 7-8 years understanding of architecture. If you look back at PS3 and 360's year one games and compare them to Wii U's year one games, the differences are startling. Having said all that, graphics aren't everything. They're nice, and I'm all for the best you can achieve, but there are other equally important and more important factors to consider. 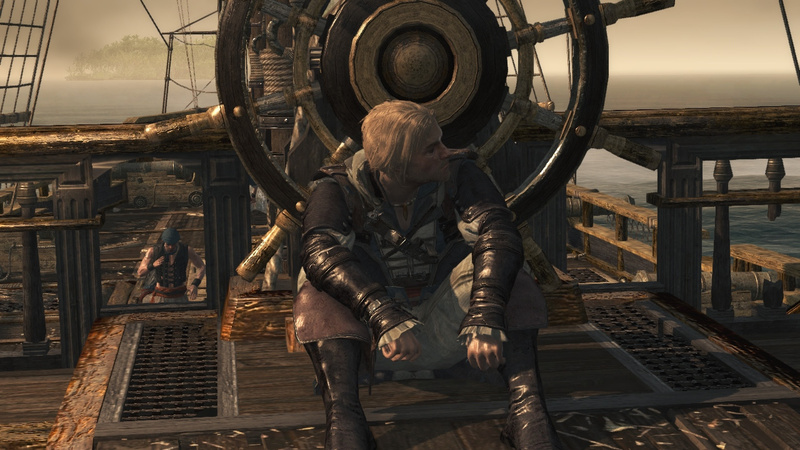 I'm glad AC4 looks great on Wii U, but what sold me on this version over the PS4 version is the GPA. The gamepad advantage always sells me on the Wii U version over other versions, because it's just such a nice feature to have and use. At the least it offers convenience and de-clutters the TV screen. At the most it creates an entirely new experience not possible on any other hardware. And it always offers off-tv play, which is a great tool to have in various circumstances. loving it, def going to buy it. People complain the wiiU game sales are low, and yet they keep complaing about everything that is anounced lol..
looks good, possibly a bit better than the ps3/360 version but still not up to par with ps4. i saw a graphics comparison on youtube between ps3 & ps4, and the ps4 had it beat in pretty obvious ways. Higher res textures (so a lot clearer image, a lot more detail), the ocean wasn't blurred in the background on ps4, it was gloriously rendered, the draw distance was much improved, and overall everything definitely looked sharper and clearer. Wii U seems to be somewhere in between. The railing on the boat in the second screenshot shows higher res textures than the ps3, maybe even as good as ps4? but the ocean in that same screen is a blurred background, akin to current gen as opposed to next gen.
Wii U is treading water between the two generations, like we knew it would, if developers actually tried. Glad to see Ubisoft seemed to actually try! Ive been playing my copy since tuesday, but one thing I notice is when synchronizing in jungle type areas. 1/4 of an inch around Edward there seems to be a blurring/lag as the camera rotates. It doesnt happen every time either. Other then that its great. Anyone else notice the issue ive seen when synching???? Got this Thursday for WiiU and it rocks....best multiplat port to date. I played the prologue on ps3 and there is more than a little difference.....WiiU much better textures, better lighting, better effects like smoke/fog/water and most importantly betterl framerate......anyone who is saying this is marginally better than ps360 is drunk because this is a true step up when you actually play them. Also on first run it does a 1.1gb 'update' which I am convinced is essentially like an HD install of core compenents....great, quick load times and no real problems with popup or texture loads, not cutscene hiccups. The only real difference I can see between WiiU and Ps4 videos is character facial rendering. If you own a WiiU you really owe it to yourself and Ubi to BUY this game. @CasuallyDressed Those issues are in all of the console versions.